Los Angeles artist Sandow Birk is a well traveled graduate of the Otis/Parson's Art Institute. Frequently developed as expansive, multi-media projects, his works have dealt with contemporary life in its entirety. With an emphasis on social issues, frequent themes of his past work have included inner city violence, graffiti, political issues, travel, war, and prisons, as well as surfing and skateboarding. He was a recipient of an NEA International Travel Grant to Mexico City in 1995 to study mural painting, a Guggenheim Fellowship in 1996, and a Fulbright Fellowship for painting to Rio de Janeiro for 1997. In 1999 he was awarded a Getty Fellowship for painting, followed by a City of Los Angeles (COLA) Fellowship in 2001. In 2007 he was an artist in residence at the Smithsonian Institute in Washington, DC, and at the Cité Internationale des Arts in Paris in 2008. His most recent project involves a consideration of the Quran as relevant to contemporary life in America. 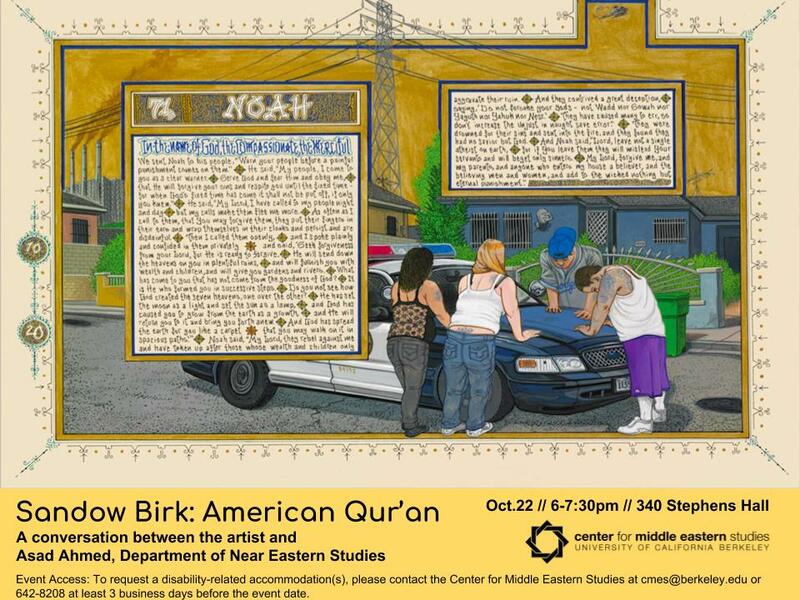 Over the past decade Birk has traveled extensively through the Islamic world, visiting several of the most populous Muslim nations as well as important collections of Islamic artworks. It was these travels, along with political events across the world, that inspired his initial interest in Islam and the Quran. During the course of the project his travels included repeated research visits to a variety of places, from the largest mosque in Africa to the remote Islamic outposts of Mindanao in the Philippines and the Andaman Islands of India. Among several other places, extensive research has been done throughout Morocco; at the Institut du Monde Arab in Paris while on a three-month residency at the Cité International des Artes; and at the Chester Beatty Library in Dublin, home to one of the largest and finest collections of hand-illuminated Qurans in the world. Further research was done at the Smithsonians Freer and Sackler Galleries, and the Museu Calouste Gulbenkian in Lisbon.